The Fox Theatre transports audiences from Peachtree Street to the streets of New York in 1899 with young newspaper boys struggling to sell Joseph Pulitzer’s papers on every corner. Showing from Jan. 20 to Jan. 25., the show presents a timeless story of friendship, loyalty and unwavering hope despite unpredictable and innumerable obstacles that transcends into the heart of each viewer. “Newsies” is a relatively new production, first premiering in 2011 at the Paper Mill Playhouse in New Jersey, making its Broadway debut in 2012 and launching its first North American Tour in 2014. Disney Theatrical Productions based “Newsies: The Musical” on the Disney film, “Newsies,” produced in 1992. The film and musical are both inspired by the New York City newsboys’ strike of 1899 and chronicles the events that culminate in the city-wide protest. “Newsies” follows the plights of the New York paper boys, known as the newsies, as they struggle to withstand the city’s challenges. Many of the newsies are orphaned and homeless, and the young boys’ desperate life situations make selling Joseph Pulitzer’s newspapers their only option for survival. Young Jack Kelly, played by Dan DeLuca, hopes to sell papers only until he can finally leave New York and head to Sante Fe. Jack is a natural leader with a criminal past that he tries to conceal. As Joseph Pulitzer, portrayed by Steve Blanchard, continues to raise the price of his paper to increase profits, the newsies suffer. One day, Jack and his disabled friend, Crutchie, performed by Zachary Sayle, are chased down by the director of the juvenile detention center. Jack and Crutchie find safety by hiding in Medda Larkin’s theatre, where Jack meets the reporter Katherine Plumber, played by Stephanie Styles, with whom he becomes instantly becomes infatuated. From the opening act, the audience is greeted by the actors’ heavy and convincing New York accents. Each performer captured the essence of the individual played without breaking character. DeLuca radiates Jack’s leadership and caring personality, while Sayle commits to the quirky, yet sweet demeanor of Crutchie. The lighting and set design truly gave the audience an inside look into the streets of New York in the 1890s. The actors interacted with each set, many of which spanned multiple floor levels as they climbed, jumped and twirled at increasing elevations. Between numbers, the sets seamlessly transformed from one corner of New York to another. Additionally, “Newsies” made frequent use of a projector that displayed images in the background and the areas surrounding the actors. Using a projector has become a trend in stage productions because projected images stand in for costly freestanding sets. At times, the images were powerful and advanced the drama in the acts. During certain numbers, however, the large and slow-moving images simply distracted viewers from the otherwise astounding performance of the actors. Among the inspiring serenades and routines was a script that conveyed the desperateness of the newsies’ situations as well as the boys’ love for life and adventure. The script was clever, witty and raised many laughs from the audience, and the actors’ delivery of the comedic lines was timely and unexpected. Each character was well-developed and even relatable to an extent. The lyrics penned by Jack Feldman were catchy and emotional. The intertwining of the lyrics’ honesty and humor combined with impressive high notes produced numbers that left the audience applauding and wanting more. The music created by Alan Menken drew viewers into every scene with powerful compositions. Famous playwright Harvey Fierstein collaborated with Feldman and Menken to write the book for the stage musical, and every number captured the essence of the newsies’ unwavering spirit. Each song emphasized the true vocal talents of the ensemble, while each actor conveyed the honest emotions of the character while belting out monumental high notes. In each of his solos, DeLuca never wavered in his strong renditions of his character’s hopes and dreams. Sayle’s rendition of “Letter from the Refuge” made the audience feel the desperation and struggles that the newsies had to endure while simultaneously conveying their determination to overcome obstacles. Sayle hit every note while maintaining Crutchie’s unique voice. The combination of the casts’ strong vocals and the orchestra’s impeccable skill made number after number shock the audience with their talent. Among the impeccable numbers, DeLuca and Styles duet. “Something to believe in,” stood out in the minds of viewers for both the convincing the audience of the passion between the characters as well as the extreme difficulty of the song’s notes. The pair’s vocals perfectly compliments the others’. Although the other two songs are more commonly featured for their choreography, perhaps the most moving song of the whole musical was “Once and for all” as the boys rally together one last time before their face Joseph Pulitzer for the last time. The sole issue of the whole performance was the occasional microphone thump that was probably not noticed by the completely engrossed audience and did not detract from the show. 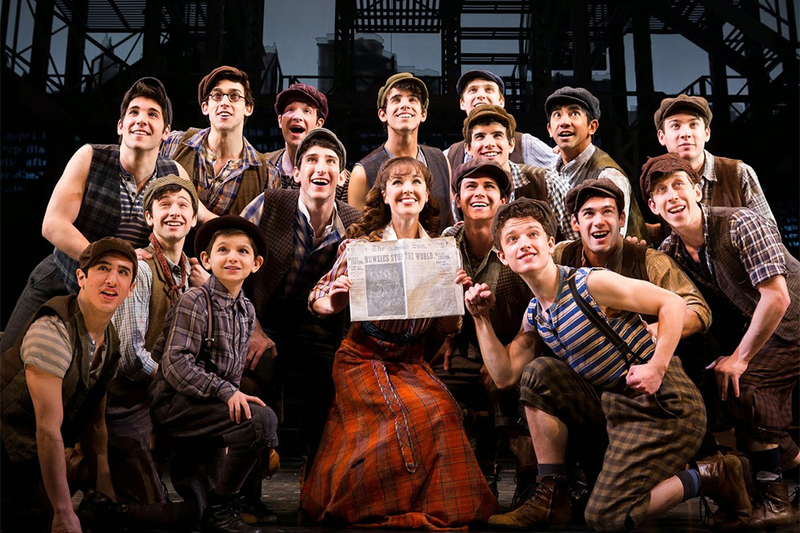 At the end of the day, Newsies dazzles viewers and delivers an impressive performance that makes the audience root for and share in the characters’ dreams.